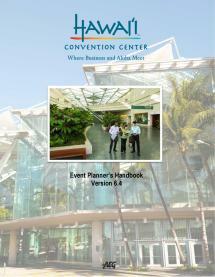 The PDFs below offer detailed information on many aspects of hosting your event at the Hawaii Convention Center. You may also be interested in seeing our technology Vendors, checking our Plans & Schematics, requesting one or more of our Meeting Planners Guides or connecting directly with one of our Sales Staff. For additional answers or information, we invite you to contact our Events Department at (808) 943-3500 or by email: eventinfo@hccaeg.com.